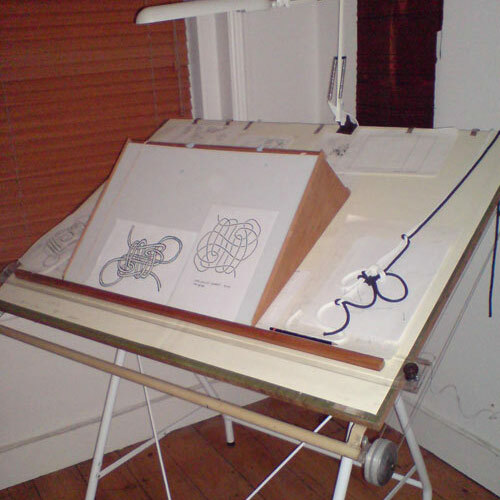 Low-resolution photo (from the Olden Days, you see) of the drawing board and makeshift light-box during work on The Knot-Shop Man, 2008-9. Specifically, I was working out how to turn knot ABK#2435 into routes in the illustations of Arxnodorum, the citadel of knots. The primitive (and hence long-lasting) inclined-plane light-box was made for me by my brother way back in 1995 for the Concuspidor project. This was its last time in service and I’ve since broken it up; I now have a smaller (A4) electric-powered lightbox. So modern.